Abelian Groups deals with the theory of abelian or commutative groups, with special emphasis on results concerning structure problems. More than 500 exercises of varying degrees of difficulty, with and without hints, are included. Some of the exercises illuminate the theorems cited in the text by providing alternative developments, proofs or counterexamples of generalizations. Comprised of 16 chapters, this volume begins with an overview of the basic facts on group theory such as factor group or homomorphism. The discussion then turns to direct sums of cyclic groups, divisible groups, and direct summands and pure subgroups, as well as Kulikov's basic subgroups. Subsequent chapters focus on the structure theory of the three main classes of abelian groups: the primary groups, the torsion-free groups, and the mixed groups. Applications of the theory are also considered, along with other topics such as homomorphism groups and endomorphism rings; the Schreier extension theory with a discussion of the group of extensions and the structure of the tensor product. 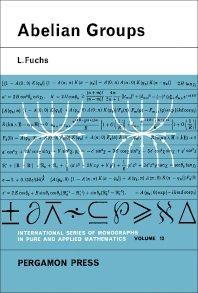 In addition, the book examines the theory of the additive group of rings and the multiplicative group of fields, along with Baer's theory of the lattice of subgroups. This book is intended for young research workers and students who intend to familiarize themselves with abelian groups.